But unless you’re an AT&T customer with $800 to spare, you won’t be able to get it. Accidents happen. And if you’re more prone to accidents than most (like me), your phone’s probably taken more than its fair share of beatings. 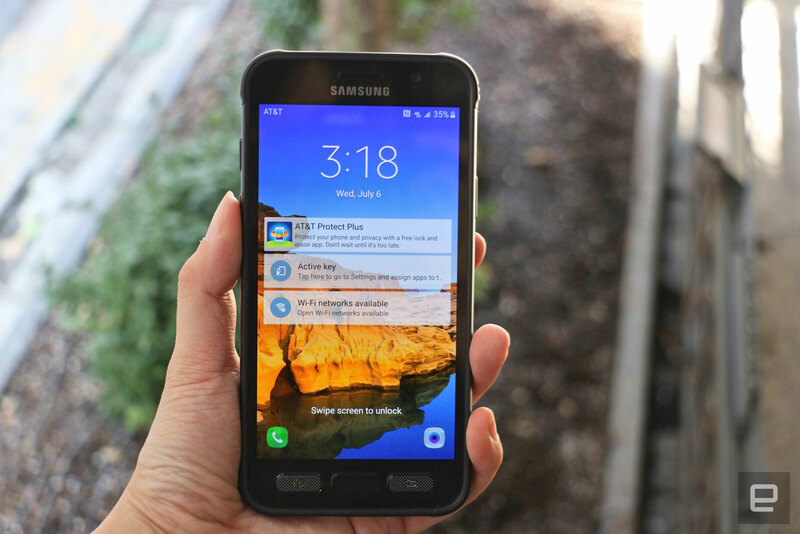 Since 2013, the AT&T-exclusive Galaxy S Active line has taken Samsung’s flagship for that year and put it in a rugged, water-resistant body. The new GS7 Active improves upon that formula, adding a shatter-resistant screen, rubberized rear, enhanced metal frame and a beefier battery than the regular Galaxy S7. You’ll otherwise get the same excellent performance, cameras and display that we already praised on the standard S7. Although it’s bulkier than the regular S7, the Active is surprisingly slim for a device this strong. Its svelte 0.38-inch profile makes it a comfortable fit in most pockets. 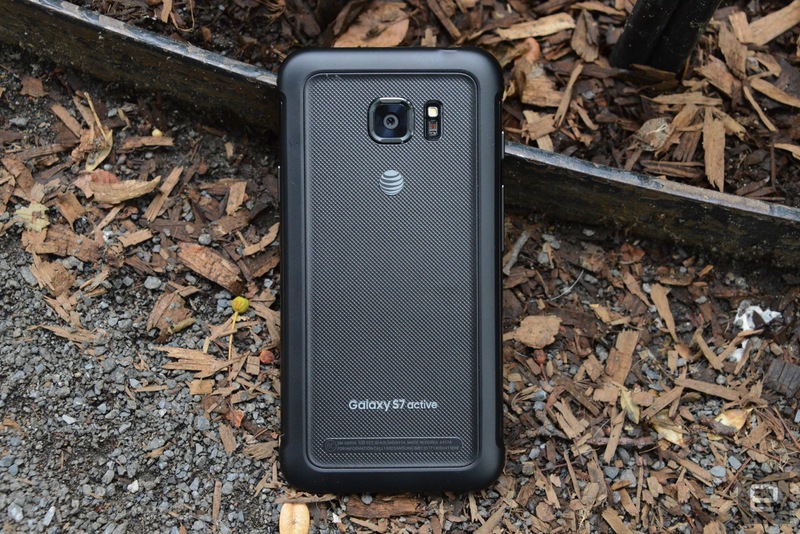 While the Galaxy S7 and S7 Edge look like they’re ready to party with their shiny finishes and curved edges, the boxy Active features reinforced corners, making it a better fit for field workers and other people whose jobs take them away from a desk. Although my review unit has a classy black case, you can also opt for “Sandy Gold” or “Camo Green” (which I find hideous). If you want to tell the two phones apart, you should also check out the buttons: The Active has physical navigation keys, but on the S7, the Home and All Apps buttons are capacitive. Another difference between the regular S7 and its hardier brother is the so-called Active key, which sits above the volume rocker on the device’s left edge. By default, it launches Samsung’s fitness tracking dashboard, Activity Zone, but you can program it to open your favorite app instead. Double pressing the Active key opens what’s known as the Emergency Zone, a feature that lets you quickly call 911 or send a preset SOS message. This year’s Active also has a microSD slot, as well as a fingerprint sensor built into the home button — two features that last year’s S6 Active lacked. In particular, a fingerprint sensor here makes it much more convenient to approve Samsung Pay transactions. But back to that ruggedness. Let’s get one thing clear there: The S7 Active is not more waterproof than the S7 and S7 Edge. All three phones have the same IP68 rating for water resistance, which means they can withstand up to five feet and 30 minutes of immersion. However, the S7 Active has a shatterproof screen, stronger metal body and a rubberized back that lends it a nice grip. It can also survive falls from up to five feet, and has a 4,000mAh battery — a considerable improvement over the GS7’s 3,000mAh cell. Thanks to that ruggedness, I had no problem throwing the phone into my backpack full of sharp keys, and the shatterproof screen even held up after falling into the middle of a heated foosball scuffle. It was only after I subjected the Active to further abuse by drop-kicking it and dropping it three floors onto a table (a genuine accident!) that the panel even cracked. After the fall, the Active’s display was covered in scratches, but it was at least responsive. True to Samsung’s claims, the screen’s surface did not shatter and was still smooth. The cracks were all under the top layer and I could still tap and swipe on the panel without cutting my fingers on splintered glass. It’s worth noting, too, that that three-story drop was beyond the range Samsung says is safe, which makes me all the more appreciative that the phone still worked afterward. The Active’s water resistance came in handy as well when some greasy food spilled on the display, at which point I put the phone under running water to wash it off. I also liked the Aqua camera mode, which lets you shoot pics underwater and use the physical buttons as shutter triggers. Don’t venture too far, though. The S7’s rating only guarantees up to five feet of immersion, meaning deep-sea diving is a no-go. That said, if it happens to fall out of your pocket into a pool or a puddle, it’ll be fine. All that said, the best thing about the S7 Active isn’t necessarily its ability to survive accidents but how well-rounded it is as a phone. It’s basically the already awesome S7 wrapped in a more protective body, and it has the same speedy Snapdragon 820 chip and excellent cameras. Indeed, I’m most excited about the imaging capabilities here. The S7 shoots stunning photos, and the so-called Dual Pixel sensors make it easy to snap clear pictures on the fly. Instead of having the majority of the pixels on a sensor capture light information and the remaining work on focus, Samsung’s dual pixels take care of both light and focus and cover the entire sensor, resulting in speedy, accurate autofocus. What’s different here are the ergonomics. On the standard S7, the phone’s slim frame and slippery edges make it hard to hold on to when framing an odd-angle shot. But the Active’s grippy body frees me to compose scenes at the weirdest angles without worrying about dropping the device. The Active’s photos are just as clear and rich as the rest of the GS7 line too. As with other recent Samsung handsets, the Active’s selfie camera takes clear portraits that look even better with the phone’s automatic beautifying tool. Those pictures all looked brilliant on the Active’s crisp 5.1-inch quad HD AMOLED display, which boasts vibrant colors and deep blacks. Whether I was streaming the latest episode of my current Netflix binge (Criminal Minds, if you must know) or serving hundreds of plates of food in the Cooking Dash 2016 game, the Active’s bright screen made it easy to enjoy the visuals, even under direct sunlight. As you’d expect, thanks to that larger battery the Active lasts longer than both the S7 and S7 Edge. On a full charge, the Active conked out after an impressive five days of light use (some photo taking, downloading apps and Web browsing throughout the day). This extra stamina means you could go out for a hike or mountain-climbing expedition (whatever people with active lifestyles supposedly do) without worrying about being lost without a means of communication. Unfortunately, the Active, which ships with Android Marshmallow, has the same heavy-handed TouchWiz skin as the rest of the GS7 lineup. What’s more, the device is littered with bloatware, thanks to Samsung’s tie-up with AT&T. By default you get a page filled up with the DirecTV widget, myAT&T app and a folder full of the carrier’s applications, along with a second page with Samsung’s Galaxy Apps store and Milk Music. Go into “all apps,” and you’ll see a folder for each company’s titles. You can’t uninstall any of these, but you can at least deactivate them. If you can look past the software and are already itching to get the S7 Active, hang on. There’s one final caveat: The phone is an AT&T exclusive. So if you’re not on that carrier and are happy with your provider, you won’t be able to get it. For those who do qualify — and have an appropriately outdoorsy lifestyle — the S7 Active is a solid phone, and there’s nothing quite like it on the market. Other rugged phones, such as the Cat S40 ($400) or the Kyocera DuraForce ($399), are either super bulky or have lousy performance, poor displays, lackluster cameras and older versions of Android. Phones that come close to offering flagship-caliber performance in a strong body include the LG V10 ($672) and the Droid Turbo 2 ($624), but neither is likely to survive a fall to the extent that the Active can. Heck, at nearly $800, the S7 Active is one of the priciest phones on the market, period. If you don’t need a device that’s ready for multiple drops, the S7 or S7 Edge will be good enough. But for those who are more careless than most, the S7 Active is worth the investment.